The Infatuation and The California Sunday Magazine partner with Jameson and 360i to bring the neighborhood… and the shot to life. The Infatuation, the brainchild of two former music execs, taps into the growing obsession with food culture. It’s quickly become the go-to-destination for NYC millennials and influential celebs like Chrissy Teigen and Bobby Flay, in search of their next great night on the town. The California Sunday Magazine is the lovechild of Pop-Up Magazine, the wildly popular live event series, and roams across California telling stories for a national audience. It has already garnered a “National Magazine of the Year” nomination in it’s rookie year. 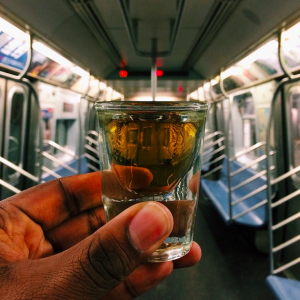 With the #Longlivetheshot campaign, Jameson wanted to connect with the ‘cool kids’ tastemakers and highlight the distinct St. Paddy’s day experiences of LA and NYC neighborhoods. Given the influence of The Infatuation in NYC, and California Sunday in LA, nativ.ly was thrilled to help Jameson partner with both to tell each city’s unique story. 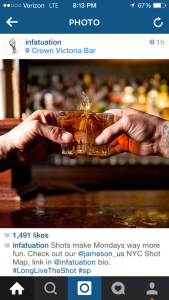 The Infatuation prides itself on a community of ‘ in the know’ tastemakers and they crafted a plan with 360i to capture the essence of the many neighborhood drinking establishments in NYC. Perfectionists by nature, they painstakingly created a brand editorial calendar including an NYC Shot Map, a gallery of favored NYC drinking spots by popular Instagrammers, and a Jameson sponsored series of “Friday Fives” where NYC bartenders list their favorite places to eat, socialize, and yes, take a shot. The content created by the Infatuation for Jameson was nothing short of stunning and their recommendations and interviews were the exact type of raw and authentic information that resonates with a millennial target that would allow them to #livetheshot. If Infatuation is your ‘on fleek’ trendy, younger cousin, then California Sunday is your effortlessly cool, ‘indiellectual’ older uncle. Cal Sunday tells beautiful, fascinating stories and they apply that same editorial voice to their advertising — via ‘Story Ads’, which are some of the most remarkable advertising you’ll ever see. Past ads have included including renown graphic artists defining what a ‘home’ means for Nest, and a Mailchimp sponsored email exchange between Ben Gibbard and Mark Kozolek. 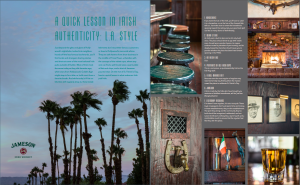 For the Jameson campaign, Cal Sunday and 360i decided to focus on capturing the spirit of the many neighborhood Irish pubs that don’t have papparazzi lurking outside, but like most things in LA, have a hint of Hollywood glamour. The end result was a ‘Story Ad’ that brought to life how a ‘real’ Irish pub should feel and what makes it unique and authentic. The beauty of this ‘ad” was that it mirrored the high-brow engaging content that the Cal Sunday audience has grown to love from the magazine. Essentially, native advertising at it’s best and most pure. What’s Next: Both The Infatuation and California Sunday are looking to partner with brands who want to co-create compelling brand stories that add value to their audiences. Only those willing to truly collaborate need apply.